A medical mission to Peru. A master’s-level education in parasitology. A year as a high school science teacher. For Wausau resident Alexander Trecartin, MD, all of these experiences were essential steps in the path toward becoming a family doctor. 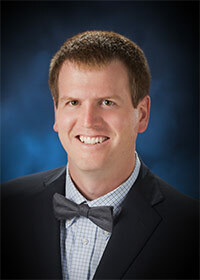 Dr. Trecartin’s journey began as an undergraduate at Andrews University in Berrien Springs, Michigan, near where he grew up. After his first year, he traveled to rural Peru on a medical mission, where he helped treat parasitic diseases, remove decayed teeth, and provide other medical care for people there. The experience ignited a passion for overseas humanitarian work. A year later, he switched his major from engineering to biology, but medicine was not yet part of his plan. After college, Dr. Trecartin completed a master’s degree in biology under the mentorship of a parasitology professor. Recognizing his interest in the field’s clinical applications—its impact on disease and treatments to improve people’s lives—he had to choose between pursuing a PhD or a career in medicine. In the two weeks between graduation and starting a job as a high school science teacher in Texas, he studied for the MCAT® exam and applied to medical school. A year later, he entered Loma Linda University School of Medicine. Dr. Trecartin entered medical school thinking he would ultimately specialize in infectious disease. But he soon discovered the rewards of family medicine. The Wausau residency program proved to be a perfect fit, both personally and professionally. It offers four distinct seasons and plenty of outdoor recreational opportunities, plus what Dr. Trecartin calls “a culture of encouragement” that fosters clinical excellence. In the future, Dr. Trecartin wants to work and live in a rural setting, and care for an underserved population. Wausau residency program coordinator Deanna Froehlich confirms that desire. “His eyes light up when he talks about rural medicine,” she says. He also wants to practice overseas, perhaps long term. But for now, he’s happy to be back in the Midwest. When not working, he and his wife enjoy the beauty of north-central Wisconsin and the proximity to their families in Michigan and Missouri.